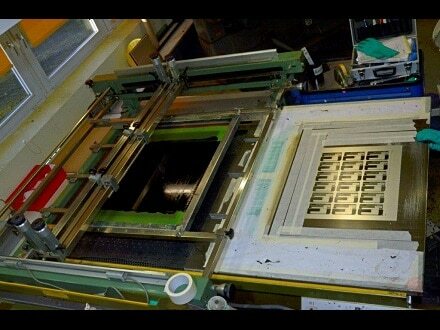 In screen printing the colour is pressed through a fine meshed silk screen. 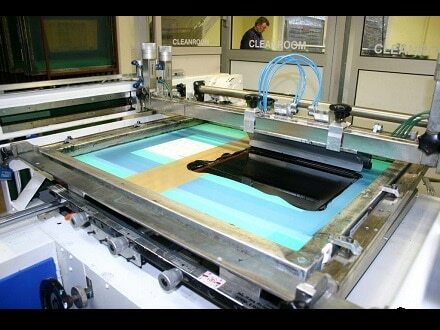 Screen printing enables printing on almost all kinds of materials. Not only flat surfaces such as foils or plates but also formed parts (bottles, cowlings and vessels) can be printed. The printed sizes can extend from just a few millimetres to several meters. The printing of plastics, textiles, ceramics, glass and metal is possible with suitable colours for the high expectations and through the relatively thick application of the colour layer a bright and effective result on the area can be achieved. The resilience against weathering, abrasion and detergents is very high. The speed of the printing process is somewhat slower than the offset method, but the use of screen printing in industrial applications is irreplaceable. UV-Paints dry and harden under light and not through evaporation of solvents. They are highly lightfast and can be immediately exposed to chemical or mechanical processing.